With over three decades of experience, Coastal Roofing Co., Inc. is your go-to source for residential and commercial roofing projects. Locally owned and operated, we are committed to meeting the unique needs of each customer. Our roofing experts bring in-depth industry knowledge to every task, ensuring complete satisfaction every time. At Coastal Roofing Co., Inc., we know you count on reliable, affordable roofing services to protect your home or business. That’s why we offer top-quality residential and commercial roofing services at reasonable rates. As your trusted local roofers in Baltimore, MD, we consistently deliver the expertise you need to ensure your roofing project is completed to perfection. All of our highly-trained experts are licensed, bonded and insured, and we hold an A+ rating with the Better Business Bureau. We are known as friendly, professional and dependable. This established reputation has created a long list of satisfied customers throughout the Baltimore area. Our roofing experts specialize in a wide variety of roofing services. 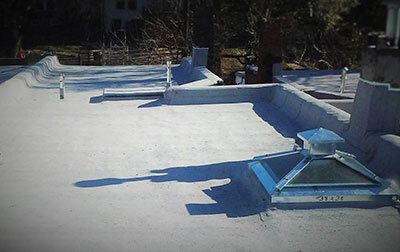 Whether you need roof repairs in Baltimore, MD or all-new installation, we apply industry-leading techniques to guarantee impeccable results. Our comprehensive skills include roof repair, flat roofing, re-roofing, tear offs, aluminum roof coating, wood repair, siding and gutter installation, slate repairs and maintenance-free Ruberoid. It’s easy to see why we are the premier roofing contractor in Baltimore. For our experts, no project is too big or small. Coastal Roofing Co., Inc. is ready to meet all your roofing needs. We are a locally owned, family-run business, established in 1991. Our roofing experts offer over 35 years of experience in the industry. Our solid reputation includes an A-plus rating with the Better Business Bureau (BBB). Contact the experienced professionals at Coastal Roofing Co., Inc. to receive a free estimate for your next roofing project.